Plain weave is also named as tabby weave, Calico weave, alpaca weave, linen weave and taffeta weave; it is the most essential of three primary types of textile weaves (along with satin weave and twill weave). Plain Weave is sturdy and hard-wearing, used for fashion and furnishing fabrics. It is the most common simplest and tightest of all other weaves. The warp and weft yarns are aligned in Plain Weave, so that they form simple criss-cross patterns. Each weft yarn crosses the warp yarns by running over one, then below the next, and the process will takes place simultaneously. Impartial plain weaves are fabrics in which the warp and weft are made of threads of the same weight and size and same amount of ends per inch as picks per inch….. Basket weave is different from plain weave in which two or more threads are bundled and then made as one in the warp or weft, or both by weaving mechanism. The appearance of Plain Weave looks like checkerboard is also known as one-up-one-down weave or over and under pattern. The look of Plain weave is mostly flat, and it is called as taffeta weave. No distinct designs can be used. But Plain weave can be made if the yarns are in contrasting multi colors and if there is any difference in their sizes….. Examples of fabric with plain weave pattern are chiffon, organza, and taffeta. The main important purpose of considering Plain Weave for productions is only because it is inexpensive and easiest way for production. Square Plain Weave and Warp-faced Plain Weave are the variations of Plain Weave. In rib weave, the stodgy yarns are larger in thickness than the warp yarns. Rib weave produces fabrics in which fewer yarns per square centimeter are able to be seen on the surface of the fabric. Rib Weave is a thick, textural weave of plane, dry colors that has a startlingly natural sense for a man-made material. 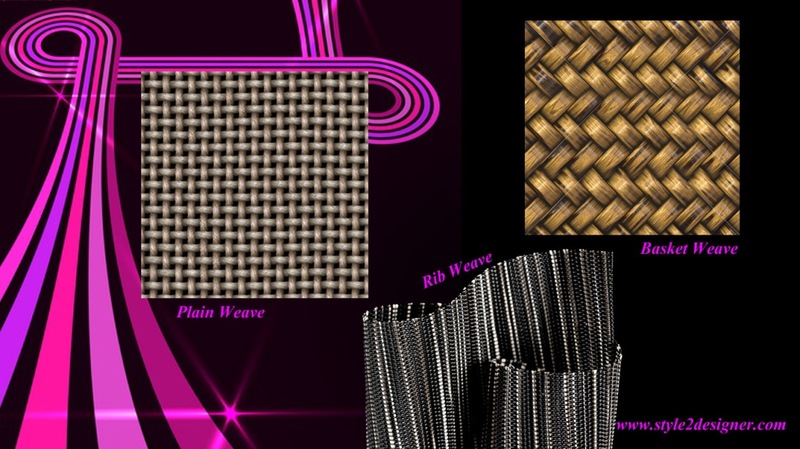 Rib Weave tablemats are obtainable in Black, Coconut, Mahogany, Pearl, and Toffee, made in USA. Here in Matt or Basket weave, two or more yarns are used in both the warp and filling ways. These collections of yarns are basket weave as one, producing a basket effect. Each filling yarn goes alternately under and over the warp yarns. An extremely flexible and rich plain woven Silk texture consisting of the Finest Singles which are firm twisted and woven in the gum form. The Fabric is later degummed. Georgette: A cotton Crepe fabric produced in the reproduction of silk georgette, with tough twisted warp and weft yarn. A good fabric is woven plain with right and left twist thread arranged in 2 and 2 order in warp and weft. Coarse Silk fabric with Slub effect material. Commonly Tussah Silk but can be Polyester, nylon and viscose. Seersucker is produced by holding a number of warp yarns at stretched tension, some at loose tension. Those at loose Tension puff up to form a kind of Blis-ter-effect, often loose and tight yarn of different colors.